It was my birthday this weekend and I was INCREDIBLY lucky. I got to spend time with lovely friends and family AND I received some pretty epic presents and cakes. But this blog is about our house (hause) so I figured I would just share my housey type gifts… of which I had a few. 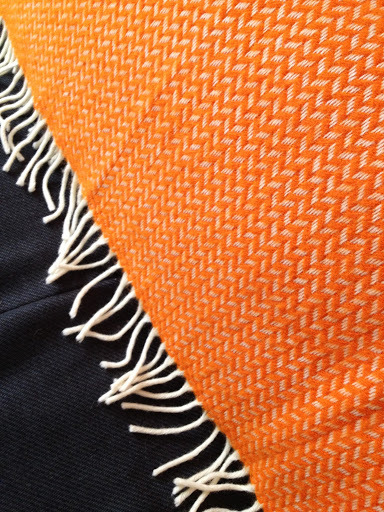 First up, this AMAZING Klippan blanket from my big sis. 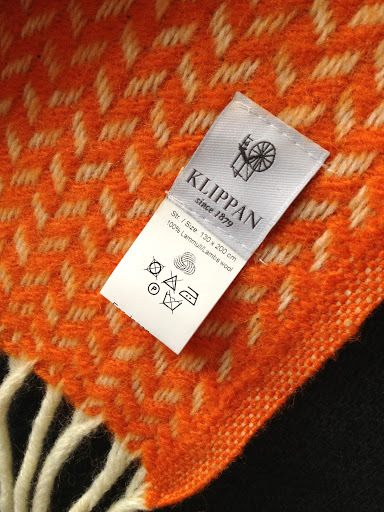 Klippan is a Swedish brand of pure lambs wool blankets in loads of amazing designs and colours. I’d actually had my eye on almost this exact blanket and had pinned it on my Pinterest, but my lovely sister had no idea and obviously struck up some kind of psychic link instead. 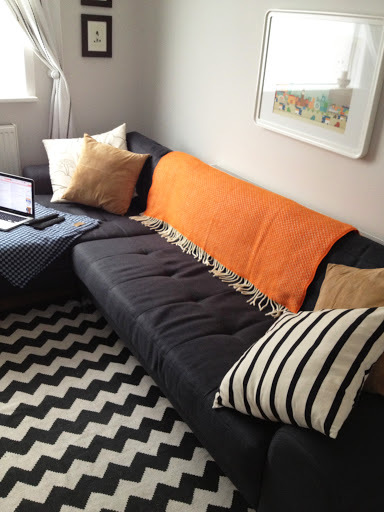 It really cosies up our living room and is so heavy and warm. I absolutely love it and reckon it will last a lifetime. 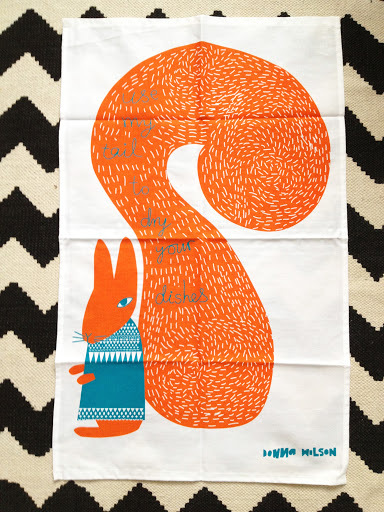 Next up, a cute squirrel tea towel by Donna Wilson. He requests that you use his tail to dry your dishes. He doesn’t know what he’s asking. Ben has a habit of using clean tea towels to mop up spilled coffee and what-not and it really upsets me, so I’m hesitant to put this squirrel through that just yet. 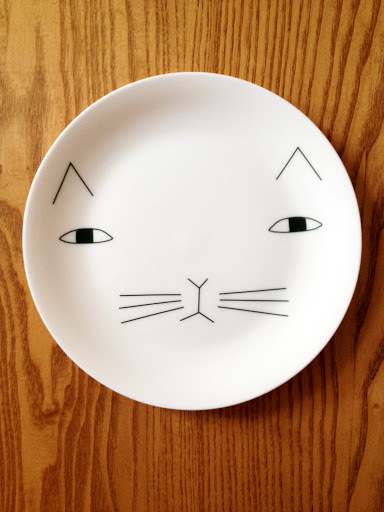 Also from Donna Wilson came the Mog plate. Another thing I’ve been after for forever and another thing my sister stole from my brainwaves without even realising. Actually it was her boyfriend who bought it for me but I image she may have something to do with suggesting it. I’m trying to decide on the perfect spot for him and it’s giving me sleepless nights. And last but not least, I received this wicked little retro sugar bowl from Sagaform. My mum had a dinner set very similar to this when I was growing up, although it was orange and brown and straight from the 70’s. That sentence makes me sound old. I’ve realised I’m starting a lot of sentences recently with “When I was younger…”. Shudder. So there you have it. 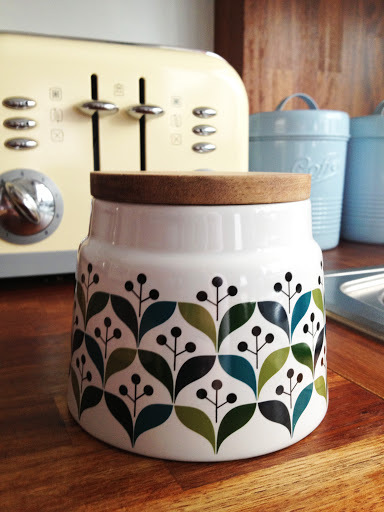 Amazing homeware-y gifts for one very lucky 31 year old. Happy Birthday me. This is quite a girly post about flowers. Someone told me once that buying flowers for your home is like showing your house you love it. I like that as an excuse. I’m really getting in to buying flowers for our house. I think it stems (!) from the fact that I find it very difficult indeed to keep plants alive for long and flowers just die after a few weeks so I don’t feel too guilty about it. 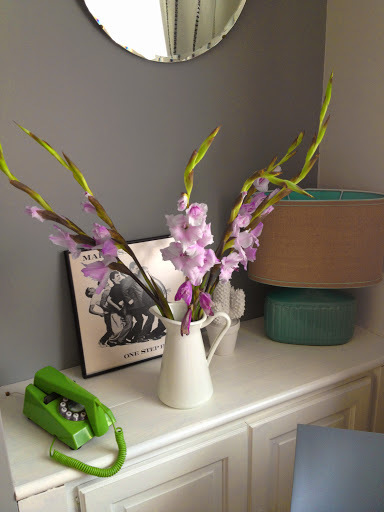 Obviously, alongside the fact that they are pretty and add colour and a bit of softness to your living environment. I usually pick up a bunch when we go food shopping, which is once every few weeks as we never have any food in and live on a diet of McDonald’s and chips, cheese and gravy. These guys in the pic above were £1.50 from Aldi of all places. 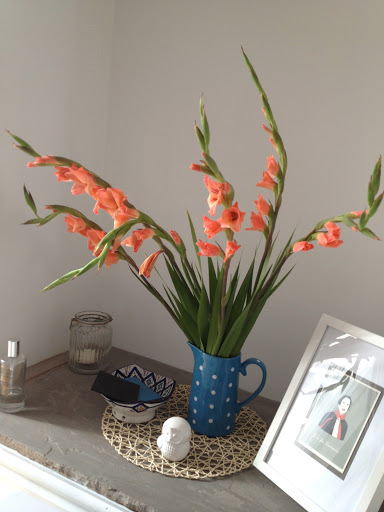 I think they are Gladiolus. I also bought another bunch in a different, amazing, coral colour. Again £1.50. Sometimes the act of going to buy flowers is actually just as nice as having the flowers themselves, so grabbing a cheap bunch of blooms in the local supermarket doesn’t quite cut it. My sister gets an inordinate amount of pleasure from going to little independent florists and finding out everything she can about the flowers she buys. I’m talking the kind of research you would do before adopting a pet. She bought me these lovely flowers this weekend from a florist in the Northern Quarter and I think it made her as happy as it made me. So there you go. 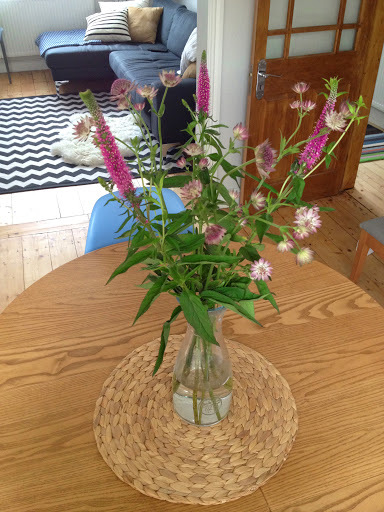 A post about all of the flowers I have in my house at the moment. It does kind of look like someone has either had a wedding or died, but it makes me very happy having all these flowers around me while I work from home. 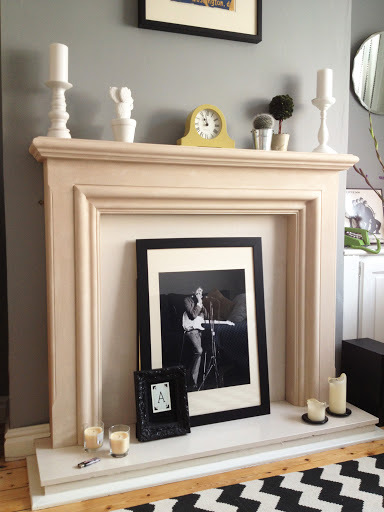 As I mentioned (understatement) in this post back in July, we no likey our fireplace. 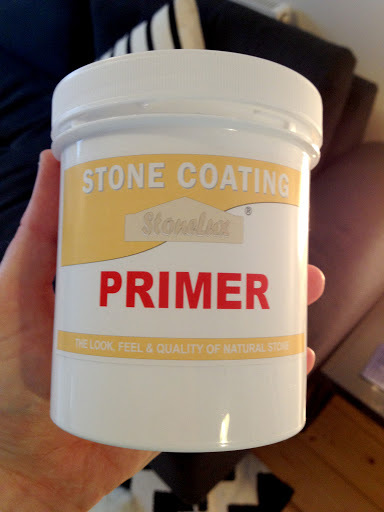 So we finally decided to do something about it, bit the bullet and bought a pack of primer and stone coating in White Limestone from Stonelux. I’ve read every review they had on their site and Googled the hell out of it and to be honest there’s not a hue amount out there to reassure you that you’re doing the right thing. 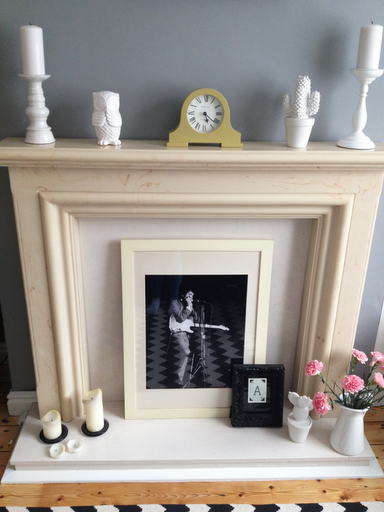 But the products themselves were only £32.44 (excluding P&P) so we figured our hatred of the fireplace outweighed the risk of it going wrong. 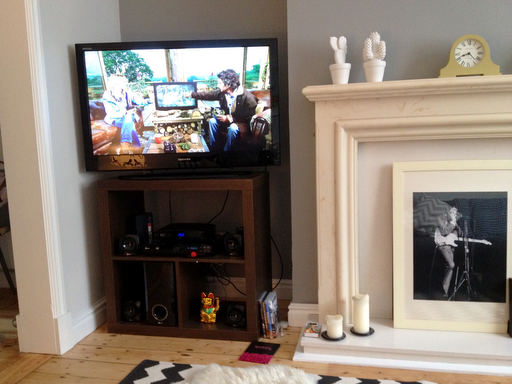 So I removed all our bits and bobs from the fireplace and gave it a bit of a clean. Are you enjoying that veiny beigeness? How’s about that SHINE! Here’s a close up just because I’m nice like that. As I mentioned in a previous post, this update was going to have to be all about the surround. We don’t have the money to fully replace the whole shebang. Don’t get me wrong, we hate the insert just as much as the surround, but we are going to have to live with it for the time being. 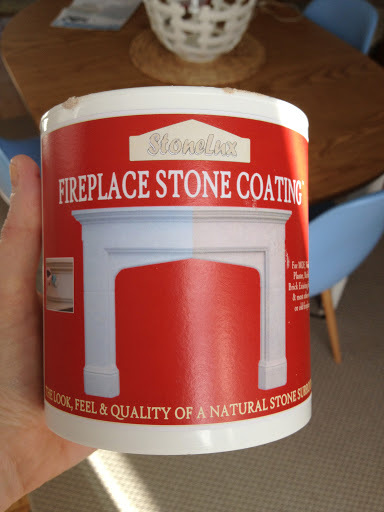 Anyway, I cracked open the primer which was included in the pack and painted one thin coat over the entire fire surround. I thought I might be a bit hesitant about finally covering the Beige Wonder, but I felt nothing if not a huge thrill. 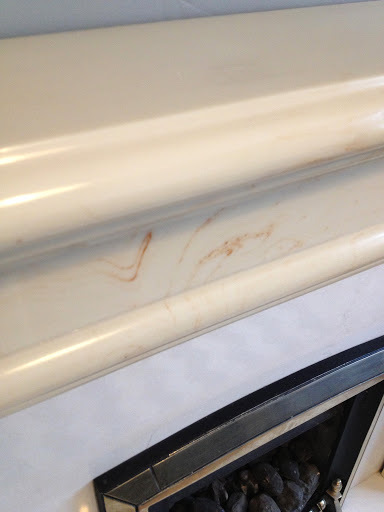 The primer went on like a dream given that it was being painted on to marble. After waiting over night for it to dry (it only specifies 3 hours, but I was watching season 3 of Fringe and got distracted) I was excited to get cracking with the actual stone covering. Not exactly loads given that you have to paint three thin coats but it was actually enough, although I was a bit concerned when I saw the size of the pot. 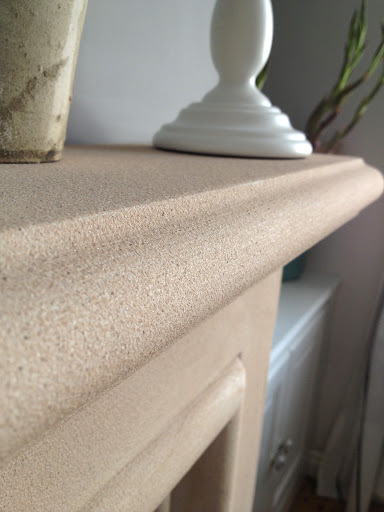 The consistency of the stone coating is so weird, it’s like painting your fireplace surround with sandy water. It smelt pretty strongly of PVC glue though so I’d imagine that’s an ingredient. I’m not gonna lie, the first coat freaked me out. It looked rubbish! I didn’t take a picture because I was panicking and starting to regret messing with Her Royal Beigeness. It was pay back. But as I built up the coats they began to go on more easily and by the third coat I was pretty happy with the finish! Check it out, don’t you think it actually looks like it’s real stone? Pretty cool no? Yeah I know, it’s not exactly a huge reveal, but you can really see the difference in real life. I think the matt effect of the stone coating is much less offensive than the shiny shiny beigey marble and the colour is just more neutral and from the cooler side of the colour family. I also painted Bob’s frame from cream to black to keep any beige/creamy tones from getting back in on the action. So there you go. 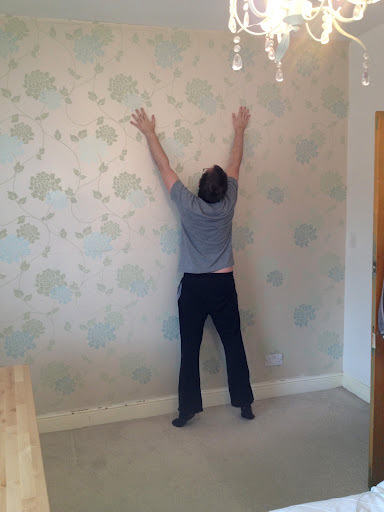 I’d definitely recommend using Stonelux coverings if you are in a situation like us. 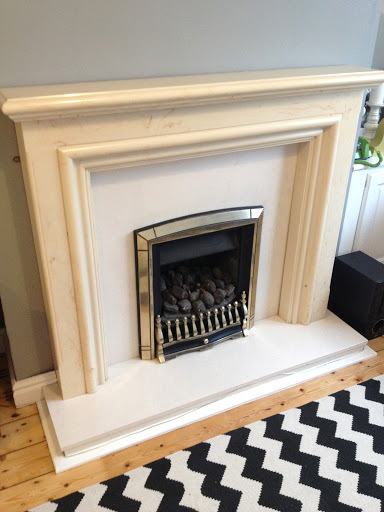 They are way more affordable than buying a brand new fireplace and can give you a bit of light at the end of the home owning tunnel. * I wasn’t perked in any way for this review, it’s all real brother. Hi. I’ve been holidaying on a remote island in Croatia but now I am back and I am here to tell you about our TV cabinet. If that’s not going to draw the crowds I don’t know what will. Well you will be pleased to know it has been rectified for a princely sum of £30. Everyone loves an Ikea Expedit bookcase as some point in their lives, don’t get me wrong, but that point was over for us (me). Our Expedit was too tall and too dark and too wrong for that space. I’d been hunting for an ideal cabinet that had taken residence in my imagination for approximately 8 months. 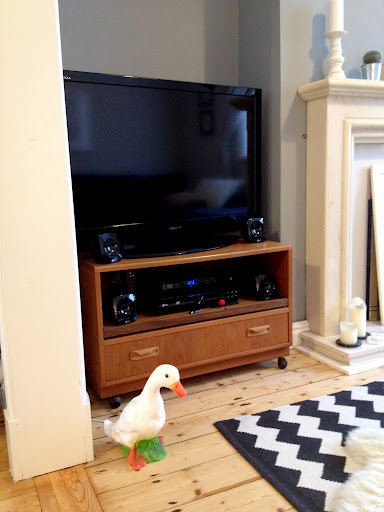 Eight months of searching ebay every other day, trying to think countless different ways of searching ‘vintage-retro-tv-unit’. Finally it appeared, sent by the retro gods. 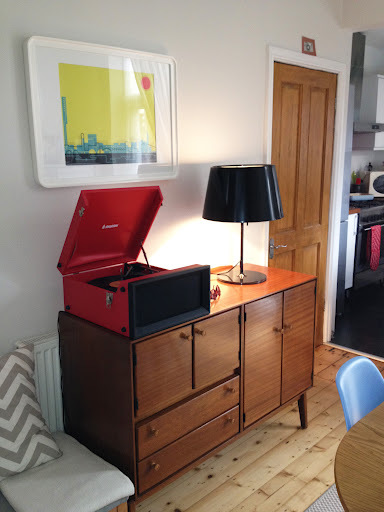 It was actually sold to us by a charity shop in Sheffield so that kind of makes it even nicer…and it also makes us less annoyed that they sold it listed as G Plan when it clearly isn’t. 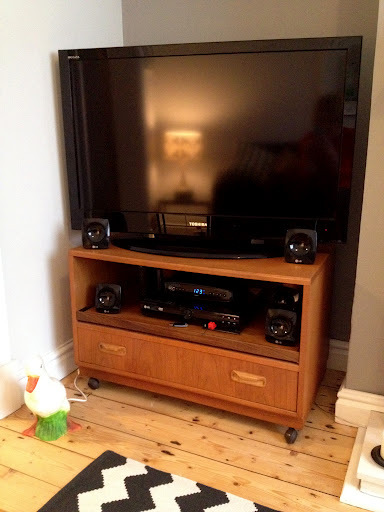 But hey, it’s old and it has nice handles, fits the space, holds the telly and even all of our other technology boxes. What more can you ask for, for £30? Totally inoffensive but totally no our tastio. We knew it had to go from the moment we bought the house and after a successful experience using this technique to remove wallpaper from the living room, we decided to finally get cracking. I think our exact words were “let’s get this done this morning and then we can go out and do something fun in the afternoon”. Look how happy and short Ben looks (we have really high ceilings). Anyway 8 hour story short. It took 8 hours. 8 hours of scoring the paper, soaking the paper, scraping the paper and crying. 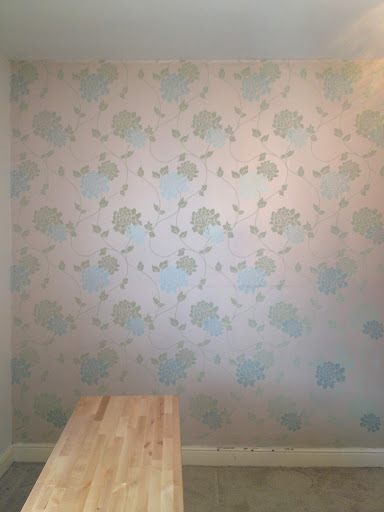 At one point I heard Ben muttering “GET OUT OF MY HOUSE” directly to the wallpaper. It was hideous. And what’s even more depressing is that it has to look worse to look better, so now our room is sporting even more Crack Den Chic than usual. But there you go. Real life DIY tribulations. We still have to go back and scrub all of the glue off of the wall and then see where we are at. 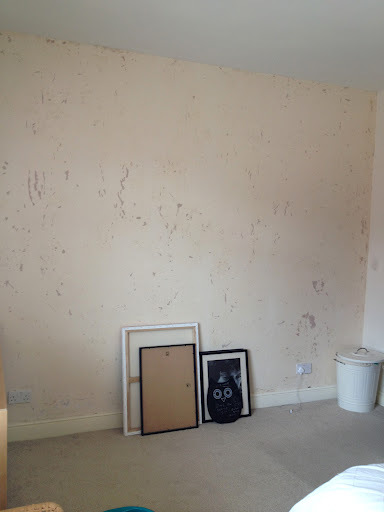 We are hoping to paint as soon as possible but after that small ordeal we might have to take some time to recover. You don’t see it? All the freaking wood? EVERYWHERE! 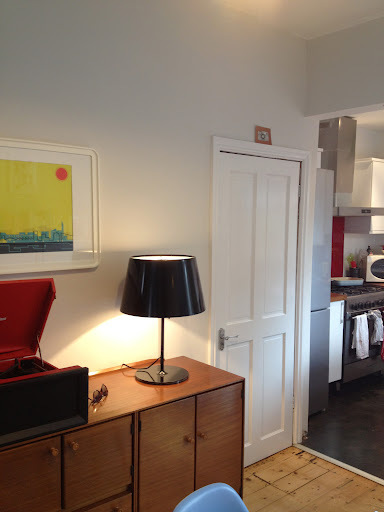 Sideboard, table top, cupboard door, kitchen surfaces…the list is endless. It’s just too much. So I played the ‘I own this house’ card and cracked open the white paint. Slightly less insane I think you might agree. It was dead easy to do as well. 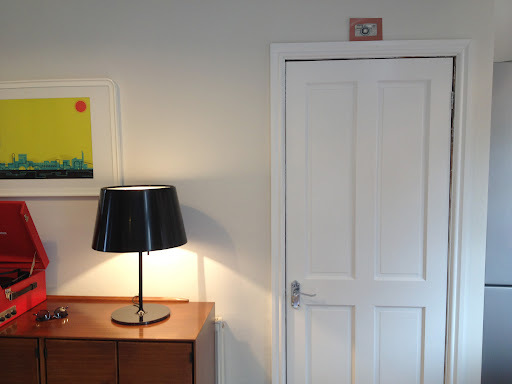 The door was originally varnished so I applied two coats of Dulux Ultra Grip primer to stop any bleed through and peeling. I like that stuff because it’s water based so a) I don’t start tripping off my face quite so early on into the process and b) it’s so much easier to clean the brushes afterwards. Then just a couple of coats of Dulux White Satin paint with a small foam roller and an even smaller paint brush for the fiddly bits and Bob is indeed your uncle. 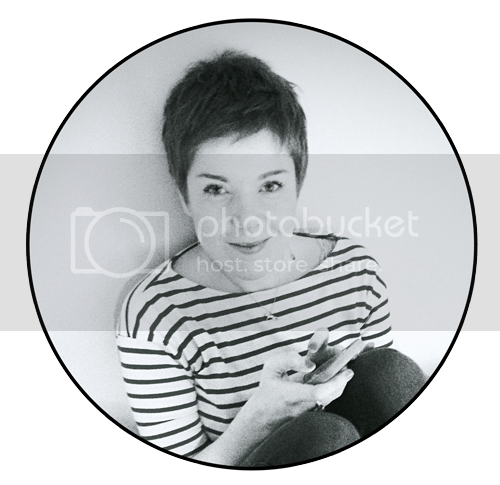 *This post is really, incredibly, dull for the majority. We inherited these Next light fittings in our downstairs hall and upstairs landing. I’m not in love with them, but I we haven’t yet dabbled in electrics, so they are staying put. A couple weeks ago I went to pop the landing light on to go upstairs and…nothing. Oh. But there are THREE bulbs in there, they CAN’T all have gone at once? Them’s some serious odds. SO there must be something more serious at fault? 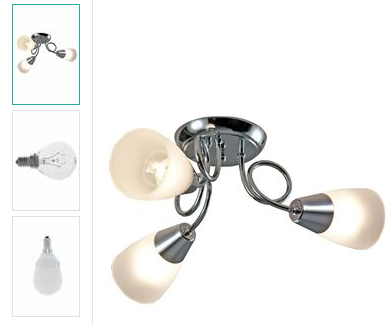 Maybe the light fitting? Maybe our electrics? Ahhhhhhh! Thoughts of an electrician knocking out our walls and rewiring things ran through my head. IGNORE. As I mentioned before, Ben and I have no experience in messing with electrics. We also do not have any dads living in the Mancunian vicinity. So we did what we thought best to do. We left it. We used the bathroom light as a replacement landing light, we used the light from our phone screens, we took turns turning off the hall light at bed time and running into darkness. It seemed to be working for us. Anyway, last night my friend Rob came over. He’s a bit more practical than Ben and I and probably (and weirdly) the closest thing to a dad we have up here. He got up a step ladder on the landing and replaced the light bulbs. WOULD YOU BELIEVE IT? All three bulbs HAD blown at the same time! Apparently that does happen? Apparently it could be the bulbs or the light fitting or even the light switch, but at the end of the day it was a bloody blown lightbulb. APPARENTLY we could have just got up the bloody step ladder ourselves two weeks ago! Anyway, I just wanted to let people know that the three bulbs blowing at once thing does happen. Who’d have thought.